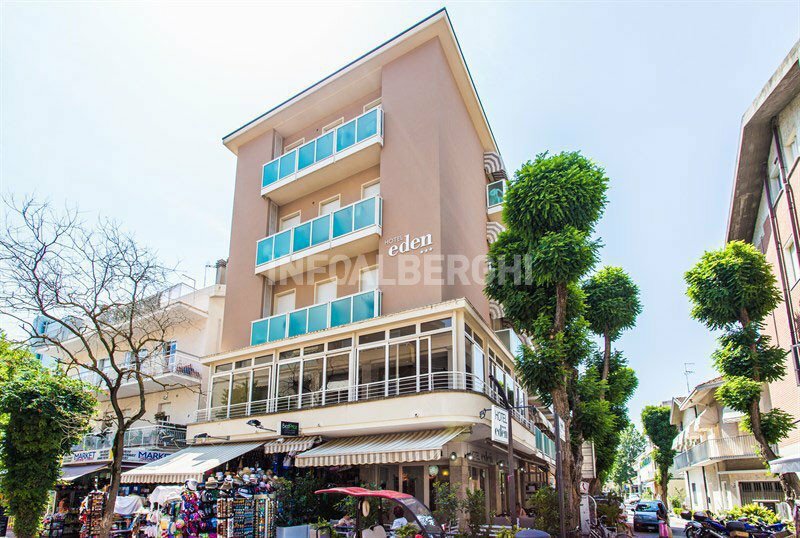 Hotel Eden , 3 star hotel in the center of Cattolica and close to the beach, has WI-FI connection throughout the entire hotel, parking by reservation, common areas and air-conditioned rooms. Pets are allowed. In Cattolica, near the sea and directly facing the traffic-free zone of Viale Dante. The square of dancing fountains, Piazza Primo Maggio, is a 3-minute walk away. The Cattolica train station can be reached on foot in 15 minutes. The rooms have a balcony with a sunshade, air conditioning, ceiling fan, WI-FI connection, TV, telephone, safe, private bathroom with shower (shower curtain in 2 rooms) and hairdryer. On request: minibar and rooms with sea view. Terrace on the entrance with sofas and tables, free use of bicycles, reading room with newspapers, 24 hour reception, lift, luggage storage service and late check out on request. The hotel organizes theme nights and offers a welcome drink. PARKING: covered and free parking spaces in the All Inclusive formula, 800 m away with shuttle service. CONVENTIONS: beach, amusement parks, discos, police and shuttle service. BREAKFAST: served buffet style with sweet and savory dishes, including cold cuts, cheeses, homemade cakes, croissants, biscuits, jams, chocolate, cereals, yogurt, fruit juices. LUNCH AND DINNER: every day are prepared dishes of Italian and international gastronomic tradition with fresh homemade pasta, hot and cold appetizers, first and second courses of meat and fish, side dishes, desserts, ice cream, sorbets and seasonal fruit. Meals are served in the air-conditioned room overlooking Viale Dante. VARIATIONS: on request are prepared vegetarian menus and dishes for celiacs with gluten-free products. OTHER: special evenings such as the Romagnola evening with typical dishes of the region and the Gala evening with a special menu based on fish are organized. In hotel: indoor and outdoor playground area, strollers, bottle warmer, equipped kitchenette for the preparation of meals 24h, pediatric consultation on request. At meals: high chairs, dedicated menus, baby food, kitchenette for parents. On the beach: live entertainment, changing table, mini / baby / junior club. The structure has an agreement with the Bagno Stella Marina n. 46/50. The beach is equipped with beach umbrella and sun beds rental, entertainment, sports fields, nursery toilet, fridge and microwave available, relaxation area and heated pool with Jacuzzi, counter-current swimming and cervical showers. The prices listed are per person per day for a min. 5 nights except bridges, fairs and festivals. FULL BOARD: Full board + water at meals free consumption. ALL INCLUSIVE: Full board + beach service (1 umbrella and 2 beds per room, and use of beach cabin) + 2 beach towels in use + Air Conditioning + Bottle of water for the night. - Deposit: And 'asked to send a deposit within 5 days from the act of booking. - Meals not consumed are not refundable, upon request will be replaced with a boxed lunch to book the night before. - Early Check-out: we will apply the maximum price of the room for 3 days as from the list Room commerce. Do not miss the Easter 2019 in the beautiful town of Cattolica!